Fickle celebrity football fan Justin Bieber has been spotted dining out in LA while wearing a personalised Arsenal training jacket. 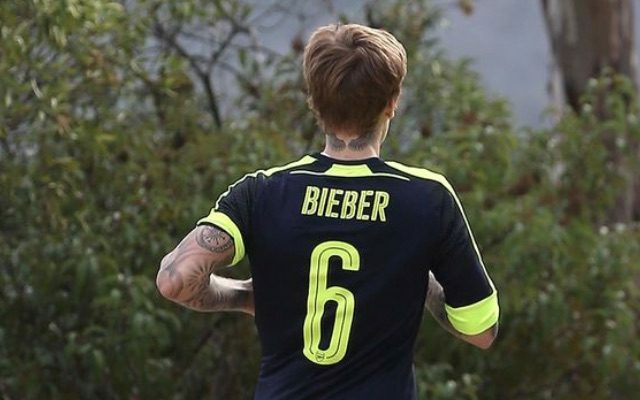 Biebs, wearing his initials alongside his favourite no.6, is pals with Gunners midfielder Alex Oxlade-Chamberlain. Really enjoyed the show on Wednesday and great to take Justin around the training ground last night ?? However, the Canadian pop star is not what you’d call a loyal Gooner. He’s previously had a kickabout in full Chelsea gear with Frank Lampard, Fernando Torres and DJ Reggie Yates. Last year, he got all friendly with Barcelona’s MSN. 7-Quando o Justin foi se encontrar com o Neymar na arena do Barcelona. And football whore Bieber has even flirted with Everton!